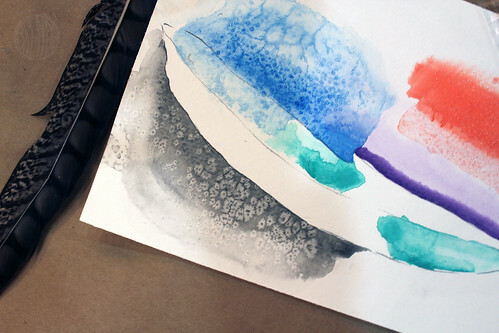 How to Watercolor in Six Easy Steps…or so she said. Last night I taught a watercolor class in a cute little shop in Fullerton for The Craft Cabinet. I’m not really an expert at the fine art of watercolor or anything but I wasn’t about to let an opportunity like that pass so I taught them everything I know—and then I brought along my friend, Deb, who is a real artist who works with watercolor washes everyday in case anybody wanted to ask the tough questions. Her art is amazing. 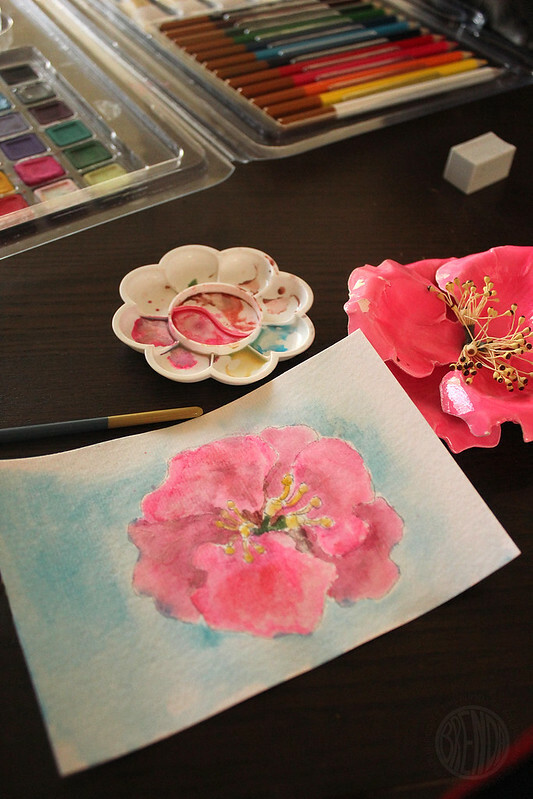 Before I share my photos from the Craft Cabinet event I thought I’d share with you guys what little I do know about watercolor. Who knows, maybe it will be interesting to someone or maybe you can laugh at me. 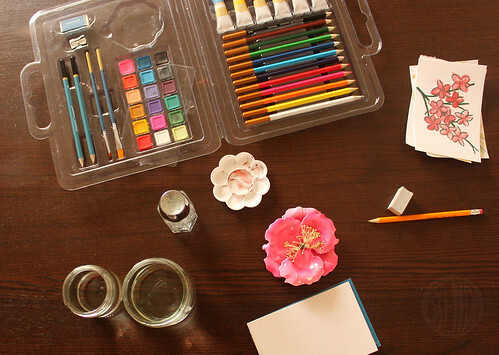 There are a lot of different ways to paint with watercolors. Some people break it down to a science. I prefer to paint by the seat of my pants. • A set of watercolors. You can spend anywhere from $80 to five bucks. These ones pictured were pretty cheap. They are a little chalky when they dry but they do the trick. Basically you’ll need a small brush for small details and a bigger brush for bigger shapes or background washes. I like a round-tipped brush because it can really absorb water as well as maneuver into small places but I’ve used angled brushes and fat brushes…you kinda just have to experiment to find out what you really like. Number Two is just fine. You know me. I love a .38 Unibal Signo from Tokoyo Pen Shop but any pen will work. I’ve even used my daughter’s pipsqueak markers. 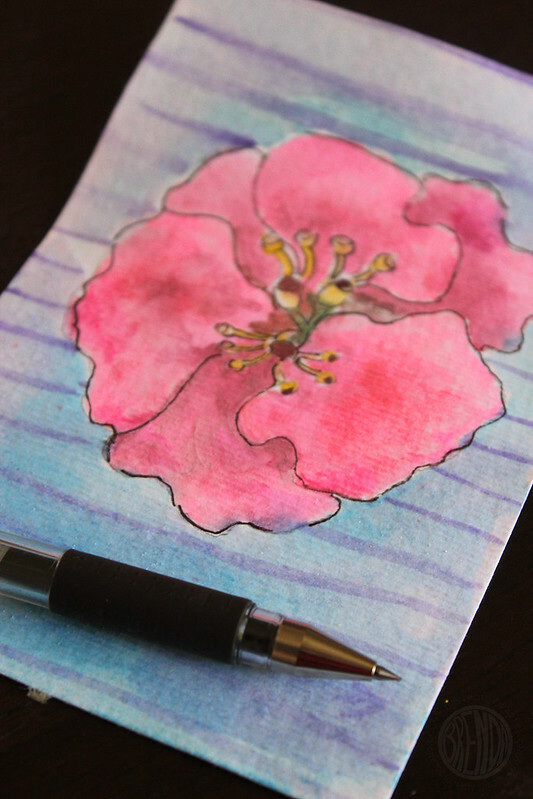 Draw your object in pencil softly onto your watercolor paper. I love to paint flowers personally. They are colorful and soft and there are a lot of variations of shade and shape that makes it really interesting. This is not a post on how to draw but I always try to tell people to not over-think it. Don’t be a perfectionist. If you can’t draw like Norman Rockwell then don’t try to. Take a more abstract approach and draw what you feel instead of what you think you know. 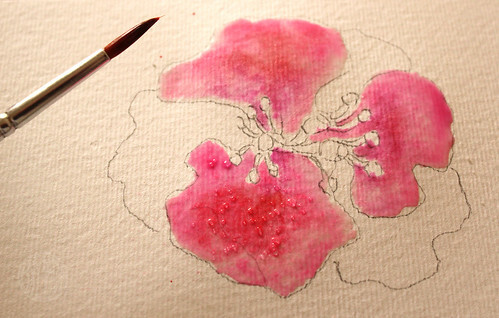 Our brains want to draw flowers according to the codes we’ve been taught since childhood. We want to make a big circle with five loops and call it a day. That’s not painting a still life, that’s just drawing a symbol. If you want to draw what is in front of you, really look at the shapes you see. The ones in positive space and the ones in negative space. Don’t worry about the rules of what goes where, just draw the shapes. Sometimes it helps to squint your eyes a little or draw with your wrong hand. You’ll hate it when you are in the middle of it and it all looks like a mess but don’t give up. Usually, nine times out of ten, the weird right-brained drawing will actually turn out better than the straight forward I-can’t-break-the-rules left-brained version. You can call me crazy. But it works for me. Give it a try. Maybe it will work for you too, maybe it won’t. Just consider it a fun exercise either way. Pick an area and paint it with just water, no paint. This is what you will paint first. It’s a good idea to paint your light areas first because you can’t paint light areas on top of dark. You can always go darker but you can’t go lighter with watercolor. It’s too translucent. This is the fun part. Grab some paint from your palette and flow it into your wet area. Side note: You might need to mix colors to get the color you want first or you might get lucky and have a palette that already has a bazillion colors at your disposal. Professional artists will have all kinds of fancy ways to mix paint but I’m kind of a messy artist and I mix paint everywhere. On the palette, on my paper, along the edges of my kit. If you find that things are getting too messy, just rinse your brush and start somewhere clean. Once you touch your paint to the wet area on your paper it will spread like magic and then stop when it reaches the edge of your shape. The surface tension will hold your paint to the edge of your shape. You can manipulate the color around your shape with your brush or you can pick up your paper and gently let it run where you want it to go. 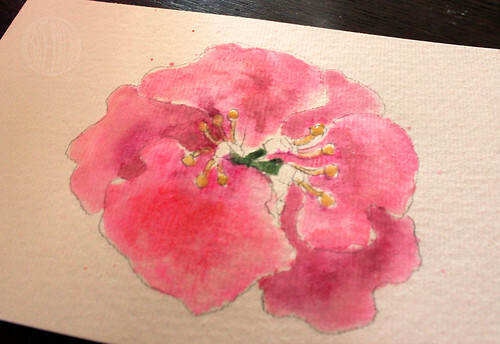 Watercolor is kind of like playing with a marble maze and your wet area edges are the walls. Roll the paint and water around and have fun with it but don’t tip your paper too much or your paint might jump the surface tension wall and drip right off your paper. 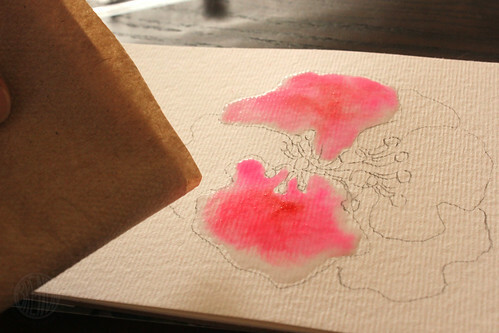 If you have too much water or paint you can always blot it up with a tissue or paper towel. Step Four: Paint everything but don’t let your wet shapes touch! Once you have one shape painted you can move onto the next but you can’t ever let the edges of your shapes touch if you want to keep a hard line between them. For example, if one petal touches another petal it will run together and there goes the definition between your two petals. Always paint areas that are away from each other. Then when those areas are completely dry, you can go back and paint the adjacent areas. If for some reason you don’t pull this off and your petals do run together into a blob don’t give up. Blobs can be pretty too. You can always fix them later with some pen and ink. Or even scrub them up a bit with a clean brush and just water. You can add layers, blend in different colors. A neat trick is painting one color and then adding another color on top that will push the first color to the edges. If you get too much liquid or something isn’t looking the way you like, just blot up a bit with your paper towel. Some people, like my friend Deb, even lightly sprinkle regular old table salt onto their paint at this stage to create a cool snowflake effect. There’s a trick to it though that I personally haven’t quite mastered. It only works when the water is thin and the salt is light. It takes practice to get it just right, kind of like skipping stones along the surface of a lake. Once your subject matter is dry now you can paint your background. I like to paint motley washes to simulate an out-of-focus depth-of-field look, bringing the focal point to your subject matter…but you can paint stripes or a solid color, it’s your call. Just like you painted your shapes you will wet the background with water and then apply your paint the same way. I like to wet the entire area and then add little drips of color and watch them explode across the page. If you want a more even look, work fast with your paint strokes so that it pushes the paint over your entire area, not stopping too long in one area. Where there is a lot of paint settling is where you will have darker color. Step Six: Add pen and ink! You really need your paint to be dry before you attempt this last step. You don’t want to mess around with ink and water. It’s a little more inky and permanent and less forgiving than watercolor. 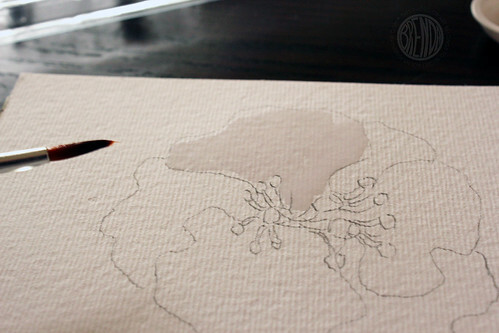 But when your painting is dry just outline your pencil lines in ink. You should still be able to see them. Add in any detail you were missing. Redefine the edges that seem a little muddy. You can even hatch in some shading if you are into that. Actually, you might want to skip this whole step altogether but I personally like to do it. It’s my cheater way to make my painting look better. 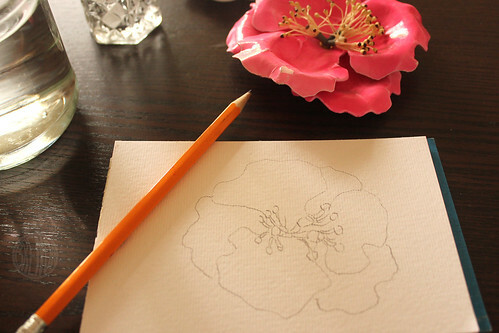 If you have a blob, now’s your chance to draw a flower on top of it (even a circle and and five loops) and it will look beautiful! Trust me. Just wing it! And now I’ve taught you everything I know. Now go forth and paint! p.s. Does anybody want to win my practice painting? Comment and I’ll pick someone randomly next week and mail it to you as a postcard. What? You don’t even want it for a bookmark or something to fold up and stick under that wobbly table leg? Fine be that way. Leslie, Deanna, Angie W, Stacy and Jenn S! Watch your email boxes ladies, especially your spam boxes because sometimes email from secret agents get stuck there.